KymCojones is proud to be a sponsor of the first Blue vs. Grey Rally presented by scootnashville.com, June 1-3, 2012! KymCojones (pronounced KIM-cojones, btw) is donating one Asus EeePC 900 netbook computer, pre-loaded with Ubuntu Linux, with AC adapter and 6-hour battery included ($139 retail value) and one HJC open face helmet in gloss black, size Large, with carry bag ($59 retail value) to the general raffle prize pool! 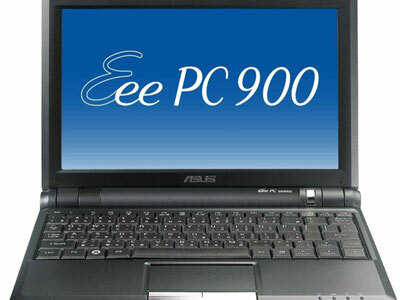 The Asus EeePC 900 is, btw, a very lightweight, low-power device perfect for stashing in many scooters' underseat storage for a quick and easy way to get on the Internet when you're traveling, and come across a free WiFi hotspot. Ubuntu Linux is very light, simple, and comes pre-loaded with the Firefox browser, and many other handy Internet and social networking applications. Each registrant ($20/person; $23/person for plus sizes) will receive in their awesome Rally Pack (containing lots of other goodies) one general raffle ticket entry, for which tickets will be drawn at random, good for whatever announced, individual good or service (such as the ones described above) donated by the sponsor, in addition to one specific raffle ticket entry for a Vespa PX125 customized by Cumberland Choppers, also to be drawn at random, separate from the general raffle drawing. Additional general raffle tickets are $1.00/each; additional tickets for the Vespa P200 raffle are $5.00/each. You can register for the rally, and additional quantities of either/both raffle tickets can be purchased online here. Pre-registration closed on May 7th, 2012. Registration and raffle tickets must now be purchased at the official Rally Registration event in person on June 1, 2012 (registration the day of the Rally will be $25 per person), and t-shirts in proper sizes are only guaranteed to the first 100 registrants. We hope to see you this June in Nashville, and good luck!